When Steve Jobs introduced iTunes 10 last week, the aspect he seemed most excited about was Ping, which he described as a, “social network for music” that piggy-backs on the iTunes Store. Ping is designed to let you follow artists and friends, share what music you’re buying and are into, and discover what others enjoy. So is it worth the Apple-generated hype? To get started with Ping, just click the Ping entry in the iTunes sidebar. You’ll be asked if you want to turn on Ping, and then it will walk you through the process of creating a profile. You can pick up to 10 songs to display as Music I Like (or let Ping pick from your rated, reviewed, or purchased songs), choose up to three favorite genres, add a bio, and upload a picture (Apple has to “approve” pictures, so the last part can take a while.) And you can choose whether other people can follow you, and whether you must approve each request—if you opt for the latter, you’ll get an e-mail each time someone wants to follow you, with a clickable link to approve the person. When you’re done, you can start using Ping. What is there to do? Well, for now, not much. You can follow friends by searching for their names; e-mailing an invitation, or see who friends are following and extend your network by following those people. And you can post stuff. Sort of. After that, pretty much all you can do is flit around among your friends’ profiles, or check your Recent Activity page (click the Ping icon in the iTunes sidebar, or the Ping button in the iTunes Store header to access this page) to see what you’re friends have been posting. There’s a lot missing from Ping. For example, what happens when you post something? Your friends can see it in their Recent Activity page, and they can comment on it. But how do you know they’ve commented, or even liked your posts? There are no alerts, no e-mails, and there’s no section on the page that offers a list of what’s been commented on. Once your posts are replaced by newer ones, the only way to know if anyone’s commented is to keep loading older posts. You can go to your My Profile page, to see just your posts and comments to them, but it’s the same problem: if you post a lot, you’re not going to want to keep loading older posts just in case someone made a comment. From this menu, you can choose to Like a song or album, or you can choose Post to write a post connected to this album that only your friends see. Ping was apparently supposed to interface with Facebook, so you could find friends on one service and add them to the other, but this feature was short-lived and vanished after a few hours. So you can’t find or invite people you know from Facebook, nor those you follow or who follow you on Twitter. Part of Ping is meant as a platform for artists to connect with fans, but it’s too early to comment on how well this will work, because only a handful of artists were there at launch. There doesn’t seem to be any way for users to set up fan pages, but that would be a good way to spur more interaction. You can’t post photos, videos, or clickable URLs, so anything you post is limited to remaining within the citadel of Ping. The biggest problem with Ping, however, is limiting it to only that music that Apple sells. When I was setting up my profile, and choosing my favorite music, I wanted to add The Beatles—but obviously I couldn’t because they’re not on iTunes. I wanted to add some of my favorite Jerry Garcia albums, but only a few of his albums are there (and not even the best ones). The list goes on. 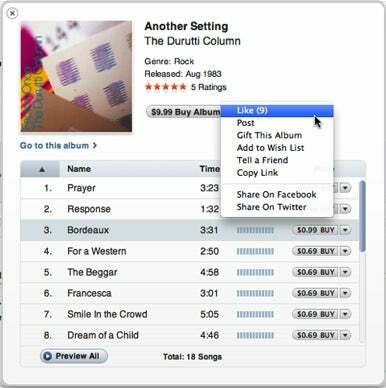 This means that people can only discuss or share music that is sold by the iTunes Store. While this covers a lot of music, it’s far from exhaustive. Ping might be successful in the long run, but limiting what users can say to comments about music sold on the iTunes Store could be Apple’s social networking Waterloo. While there’s plenty to talk about, users won’t be able to bring up bands that aren’t sold by Apple. I’m sure Apple has a plan, but so far, users seem to be greeting Ping with a big shrug. I know I have.